Yoga texts old and new talk about sangha, and sat-sangha. 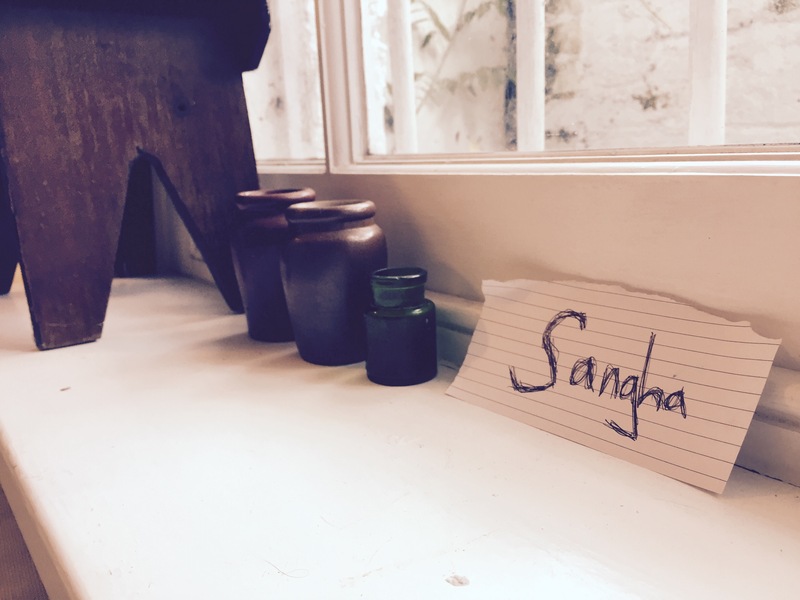 Sangha is community, or an assembly of people, and sat-sangha (which is a term often to describe a gathering of people coming together to discuss life and philosophy and yoga) means ‘good company’. Yoga and yogis emphasise the importance of building and looking after your sangha, but it’s hard to do in the middle of the whirlwind of life and work and feeling like we constantly have too much to do and no time to get it done. A German Indologist, Georg Feuerstein, writes of the idea of sat-sangha that “it is essential that we cooperate with each other as much as possible – both on the individual and the organisational level” (1). It’s the idea that we’re stronger together; having good people around us lifts our energy, and makes it possible for us to do things that would be impossible for us to do on our own. Good company provides a network of support, and of inspiration. And for both of these reasons, sat-sangha is just as important for artists as it is for yogis. To be a part of a creative community, rather than an art-maker out there alone in the world doing your thing, can add so much to your art practice (and to your life and general happiness!). You have people around you who, while they might be making completely different things, share the drive that you have to create. They’re people you can talk to about what you’re doing, or work silently alongside so that making art doesn’t have to be a lone venture on the days that you need company. Community can give you strength on the days when you question what it is that you’re doing, and reflect back at you the energy and ideas that you put into your work so that you can find new perspectives. And a creative community means that there are more resources available – you can share space, share opportunities, collaborate on projects, commiserate on the bad days, and generally widen the scope of the work of everyone involved. Yoga helps us to connect inwards, with our own selves, and in doing so it strengthens our ability to connect with the deep selves of others. Cultivating the ability to connect helps us to build communities where they’re needed. To strengthen them too, where they already exist, and keep them going. There’s something that happens to a group of people practising yoga together that’s difficult to describe; something that yoga teachers have the privilege of observing. One of the easiest places to see it is in teaching yoga classes in a workplace. You have a group of individuals who work together every day; spend all day in the same room or collection of rooms, and probably go to the pub together sometimes. They usually come into the first session with an awkwardness hovering in the air around them because they’ve never seen each other in leggings and gym shorts before and it all feels a bit too personal. And they take a mat and get in the zone, quickly forgetting the awkwardness, and move through the practice all the way to Savasana at the end, where they lie in deep relaxation, the efforts of their physical work during the session settling into their bodies. You see any residual tension gradually leave them, as you guide them through the meditative process of relaxing the body and bringing the mind to something close-ish to stillness. And then gently they come out of the posture, sit up, blink their eyes open, and you thank them. As they roll up their mats and make their way out of the room, something has changed. They’ve been lying side by side on their mats, taking a little time to work into the depths of their minds in a way that most people don’t have the opportunity to do on an average work day, and they’ve shared energy as they’ve shared the space. They made the energy of the practice together – everything that each of them brought into the room with them melted a little and merged a little and made the atmosphere of the session that they all shared, and it connected them. Victor Turner’s work on liminality and communitas is well known in anthropology. He writes about coming-of-age rituals in which pre-ritual attachments are released, so that the person in question enters a liminal phase in which their individuality is temporarily suspended; they are “neither here nor there; they are betwixt and between the positions assigned and arrayed by law, custom, convention, and ceremonial” (2). During their liminality, equality and intense comradeship is felt between the ritual participants, and all hierarchies dissolve. And then when the ritual is complete they emerge as fully-fledged members of their community, with identities and their place in the social structure affirmed. ***I’ve simplified this a LOT. Reduced it, in fact, which is sort of a crime in anthropology. If you’re interested in reading about it in detail, the book is listed in the references below! I’m not saying that a yoga class is anything like the intense coming-of-age rituals that Turner studies. But, let’s take the rough idea of liminality and apply it to a yoga class. During the practice, everyone is encouraged to temporarily let go of their every day identities, their struggles and achievements and their place in social hierarchies, and simply be. Move body, breathe air, concentrate, meditate, be. And during this process they might experience a kind of intense comradeship, and forget for a while that one of them is a taxi driver and one of them is a CEO and one of them is a king and one of them is a graphic designer (I’ve never actually had a king in any of my classes, as far as I know). And then afterwards, they emerge with a sense of togetherness. A feeling of connectedness, of community, of sat-sangha. A sense of understanding and generosity. Understanding and generosity are pretty solid qualities for a community to grow from, and to bring to existing collectives of people. All of the things we do in the name of yoga – movement, deep mind practice, the union of mind and body, learning about patterns and connections and creating space – are big things to bring to creative practice and creative life. If you have a group of people around you that you share life and work with, make the most of them! And do yoga with them. And if you don’t yet have one, maybe some of the things you develop in your yoga practice can help you figure out how to build it. Turner, Victor. 1995. ‘Liminality and Communitas’ in The Ritual Process. Taylow & Francis inc.